Until Chrome 54, the New Tab page only showed a grid of commonly-visited pages and quick shortcuts to Bookmarks and Recent tabs. Then the shortcuts were removed, and replaced with a list of recommended articles (much like Google Now/Google Feed). I wasn't a fan of the change, and the comments on that post indicated many of you were not either. 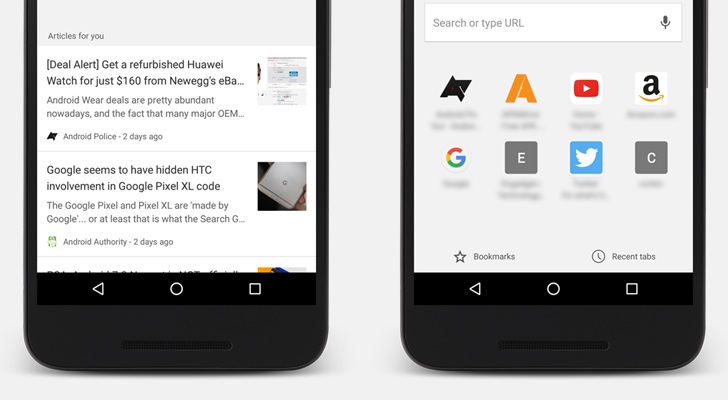 Perhaps Google heard the complaints, because the recent Chrome 56 update made the screen more useful by adding lists of recently-added bookmarks and tabs to the page. Still, for those of us who hate change, going back to the old design was as easy as changing two flags in Chrome settings. Unfortunately, one of the flags that must be disabled for that to work (#enable-ntp-snippets) has vanished from Chrome Dev 58. Disabling all other flags related to the New Tab page only seems to turn off the added features from Chrome 56 - the recommended articles remain. It's not guaranteed that the flag won't come back, or be changed to something else - this is the Dev branch, and features change constantly. We'll keep an eye out for any changes as Chrome 58 moves to Beta.